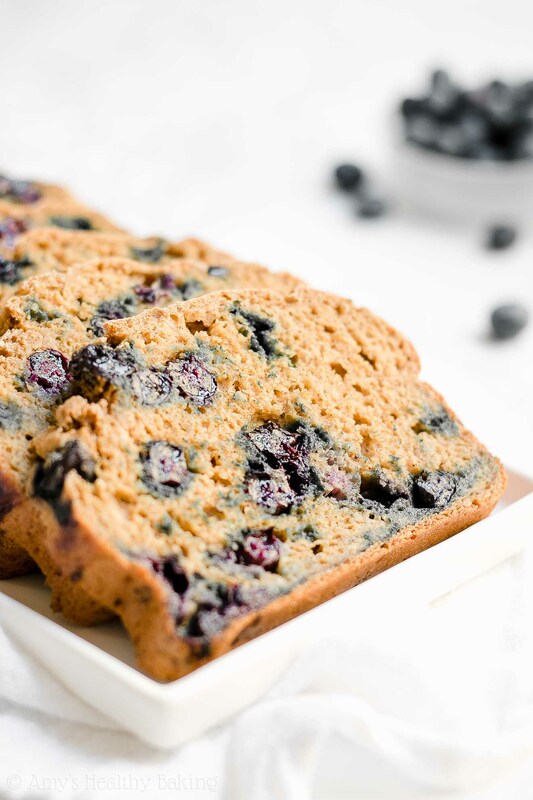 Learn how to make this healthy blueberry oatmeal breakfast quick bread from scratch! So moist & tender, no mixer required & only 118 calories! One spring weekend during my sophomore year of high school, my dad drove me to a friend’s house a few towns away. She and I planned to spend the entire day hanging out, and we started by baking blueberry muffins from scratch. After washing the dishes and watching a movie, we decided to walk downtown for a late lunch. Although about two miles away, most of the path cut through her town’s extensive greenbelt, which felt very quiet and peaceful even with all of the joggers and cyclists that whizzed past us. We arrived at the café well after the lunch rush, so the hostess seated us at one of their best tables on the front patio. My friend and I picked the same entrée from the menu: a mixed greens salad with sliced Fuji apple, feta cheese, candied pecans, and crunchy house-made croutons. And we nearly forgot all about our salads! Light and tender, with that faint cozy oat flavor… We definitely finished off the entire basket of bread before we walked back to her house! 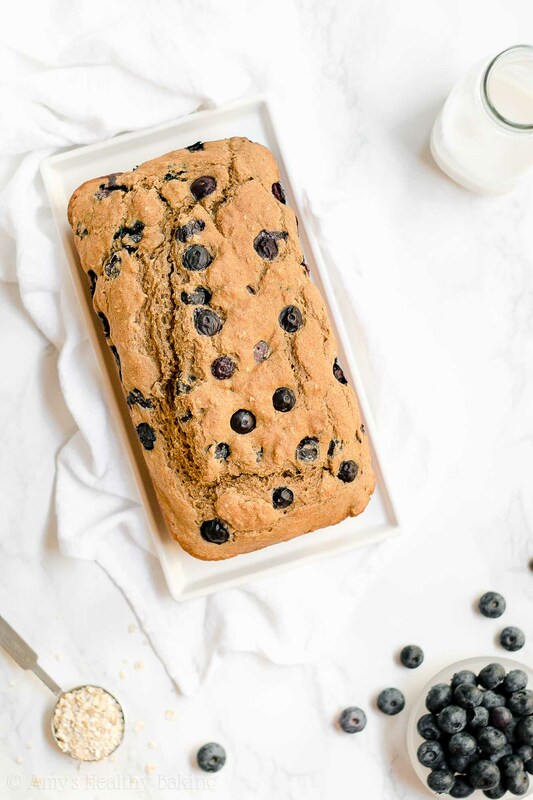 I never quite mastered the art of oat-sprinkled bread tops in my own baking… And I prefer a slightly stronger oat flavor anyway, like with this Healthy Blueberry Oatmeal Breakfast Quick Bread! In this easy recipe, the oats are baked inside of the bread (not just sprinkled on top! ), which gives the loaf a hearty yet cozy texture. Combine that with the sweet blueberries (just look at how juicy they are!) and only 118 calories per slice, and you’ve just found my current favorite breakfast! I baked another loaf the same evening after I finished the previous one… I’m that obsessed! ? 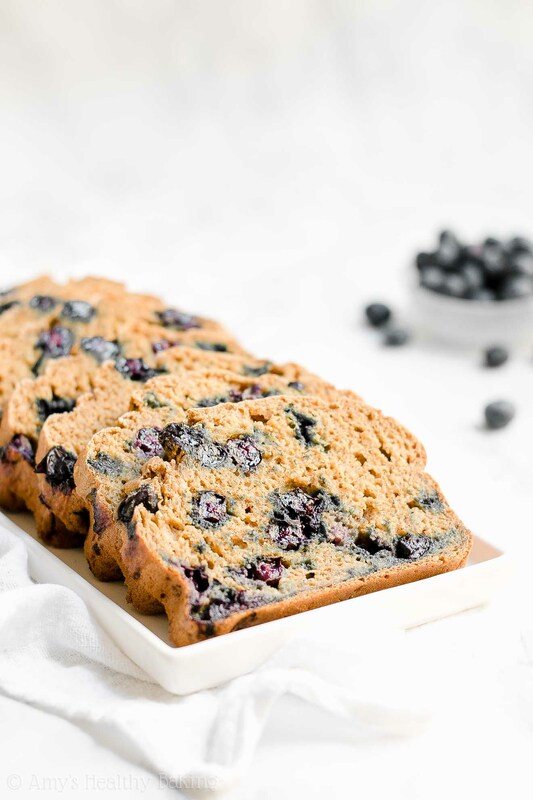 Let’s go over how to make this healthy blueberry oatmeal breakfast quick bread! You actually start with instant oats (this kind—or these for a gluten-free version!). Instant oats are smaller and thinner than old-fashioned rolled oats. This means they soften faster, which gives your healthy blueberry oatmeal breakfast quick bread a beautiful moist and tender texture. However, it’s extremely important that you measure the oats (and flour!) correctly, using this method or a kitchen scale. (← That’s the one I own and love!) Too much of either will dry out your healthy blueberry oatmeal breakfast quick bread… Especially too many oats. They act like little sponges and soak up as much moisture as they can! To start the oats softening ahead of time, you’ll actually mix them with Greek yogurt, a bit of milk, and vanilla extract. 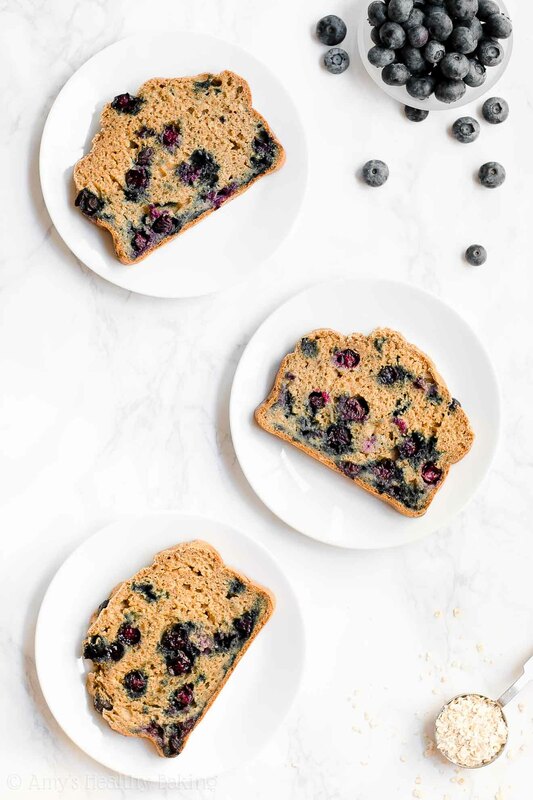 Just like in my overnight oats recipes, mixing the oats with those ingredients allows them to soak up moisture before adding them to the rest of the batter—which means you won’t end up with crunchy or dry oat bits in your healthy blueberry oatmeal breakfast quick bread! With that bowl set aside, you’ll whisk together white whole wheat flour (like this! ), baking powder, baking soda, cinnamon, and salt next. I highly recommend using this type of cinnamon, if you can find it! It has a stronger, warmer, and slightly sweeter. It’s the only kind I use in my baking now! As for the flour, such a thing actually exists! White whole wheat flour is made by finely grinding a special type of soft white wheat (hence the name! ), whereas regular whole wheat flour comes from a heartier variety of red wheat. This gives white whole wheat flour a lighter taste and texture, but it still has the same health benefits as regular whole wheat flour. Win-win! 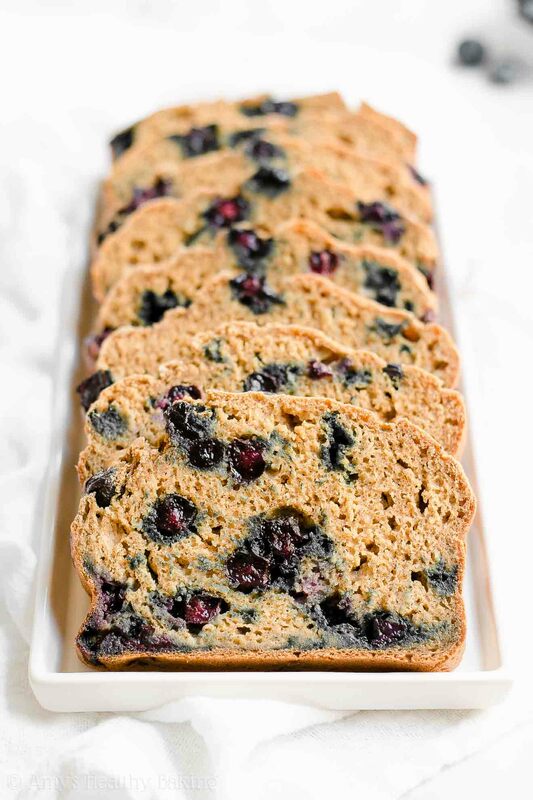 To keep this healthy blueberry oatmeal breakfast quick bread low in calories, you’ll use a mere ½ tablespoon of butter. That’s it! Other quick bread recipes call for ¼ to ½ cup (or more!) of butter or oil… Yikes! Then the rest of this loaf’s tender texture comes from Greek yogurt! If you’ve been around my blog, then you probably know how much I love Greek yogurt already. 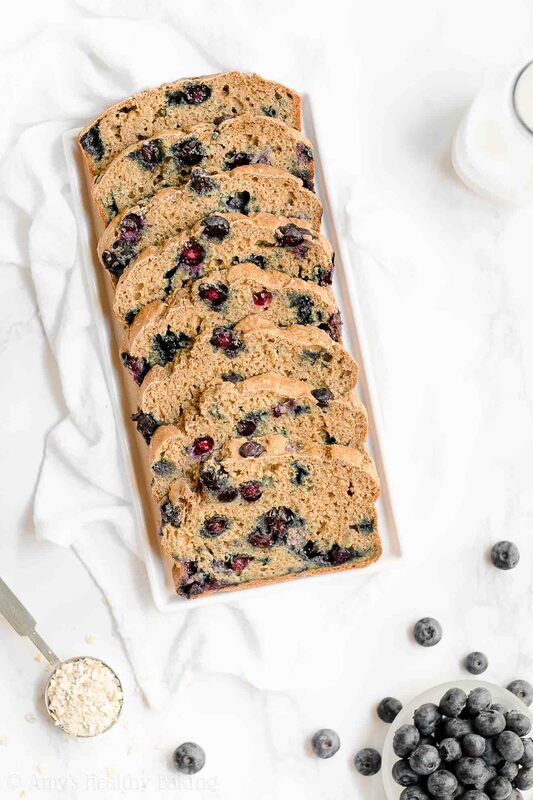 It adds the same moisture to your healthy blueberry oatmeal breakfast quick bread as extra butter or oil, but for a fraction of the calories, and it gives your loaf a protein boost, too! So… I think I’ll stick with this low calorie blueberry oatmeal breakfast quick bread instead! ? 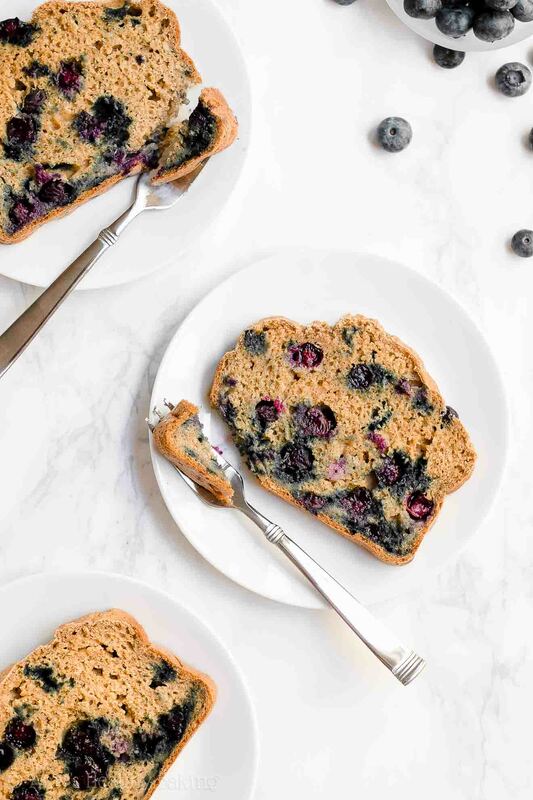 To sweeten your healthy blueberry oatmeal breakfast quick bread, you’ll use another one of my favorite ingredients: vanilla stevia. Stevia is a plant-based, no-calorie sweetener that contains nothing refined or artificial (aka it’s clean eating friendly!). It’s also really concentrated. You just need 1 ½ teaspoons to sweeten this entire loaf! 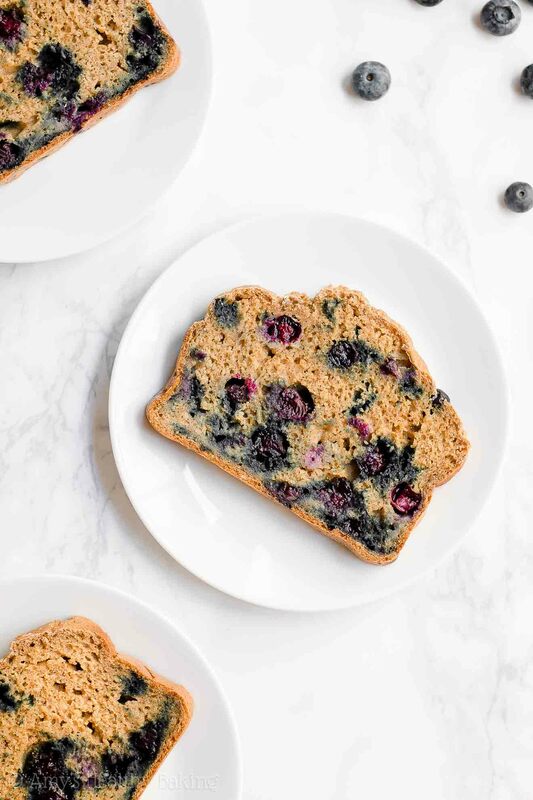 Now we can’t forget my favorite part of this healthy oatmeal breakfast quick bread… The blueberries! I used fresh blueberries because (a) they’re in season right now and really sweet and juicy and (b) they don’t stain the batter a weird gray color like frozen ones do. If fresh blueberries aren’t in season, you can definitely substitute frozen—just remember to increase the baking time! Cozy oats… Juicy berries… Moist and tender bread… How perfect does that look?? And when you make your own, remember to snap a picture and share it on Instagram using #amyshealthybaking and tagging @amyshealthybaking IN the photo itself! (That guarantees I’ll see your picture! ?) 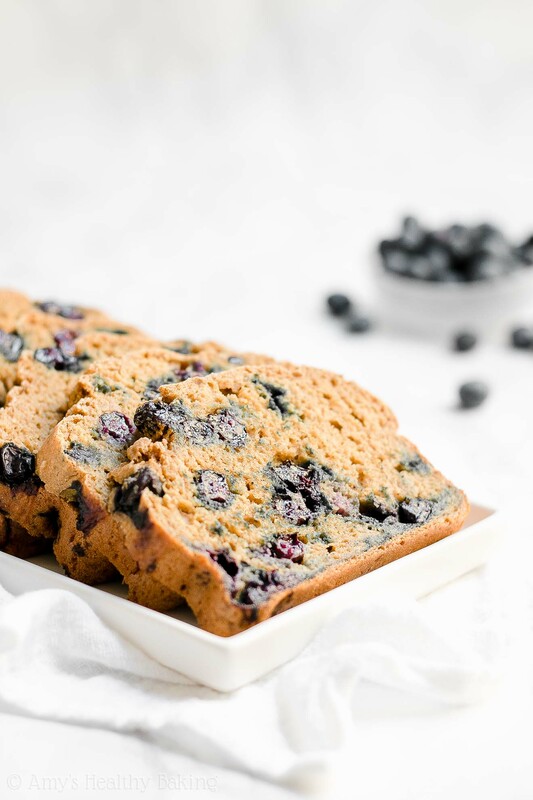 I’d love to see your healthy blueberry oatmeal breakfast quick bread! Preheat the oven to 350°F, and coat a 9x5” loaf pan with cooking spray. Spread the batter into the prepared pan. Bake at 350°F for 45-55 minutes or until the top feels firm to the touch and a toothpick inserted into the center comes out clean. Cool in the pan for 10 minutes before transferring to a wire rack to cool completely. Remember to measure your oats and flour correctly, using this method or a kitchen scale. (← That’s the one I own and love!) Too much of either will make your quick bread turn out dry. This is especially true of the oats because they act like sponges and soak up lots of moisture from the batter. The quick bread requires 2 full egg whites. The whites contain the majority of the protein in eggs, and that protein is required to ensure the loaf maintains its shape and texture while cooling. Without both egg whites, the loaf will collapse while cooling and turn out much denser. However, if you really prefer to omit the vanilla stevia from the cake, substitute ¾ cup + 2 tablespoons (120g) granulated sugar, brown sugar, or coconut sugar and reduce the milk to ¾ cup + 1 tablespoon (195mL). You may also substitute ½ cup + 2 tablespoons (150mL) pure maple syrup, honey, or agave and reduce the milk to ½ cup (120mL) instead. The baking time may vary with either of those substitutions as well. Ohhhhh man, Amy, this sounds incredible!! I can see why this would be your favorite breakfast- I love the flavor of oats in baked goods too!! SO cozy! Hello, Amy – I’m wondering if raspberries, blackberries or strawberries can be used instead of blueberries, which are not our favorite. Thank you. This recipe sound delicious! I really appreciate your interest in my recipe, Donna! Strawberries would be the best appearance-wise. Raspberries would taste great as well, but they may turn the batter a slight blue-ish color. (However, that’s completely cosmetic and doesn’t affect the quick bread’s flavor!). 🙂 I’d love to hear what you think if you try this breakfast quick bread! I really appreciate your interest in my recipe, Dorrie! If you’d like to use erythritol, then substitute that in place of the granulated sugar substitute that I offer in the Notes section of the recipe. You may need to use slightly more milk than I recommend with the granulated sugar alternative because erythritol is much more absorbent than granulated sugar, so it’ll make the batter thicker. 🙂 I can’t wait to hear what you and your son think of this breakfast quick bread! Can you replace ththe quick oats with oat bran? I used low-fat vanilla Greek yogurt instead of plain, 1.75 cups almond flour and .25 cups regular flour, estimated 1/4 cup maple syrup instead of vanilla stevia bc I couldn’t find it. I added a bit of lemon juice and lemon peel (can’t taste it though but the idea was there!) it turned out amazing! Also a handful of chocolate chips because well, I’m chocolate obsessed ? This quick bread is delicious and moist while being nutritious. It is how I want to nourish my body = sugar free, low fat, whole grain and has oats, greek yogurt and berries. I used regular whole wheat flour with some all purpose so it wouldn’t taste too wheaty, used whole eggs and baked on the longer side of times given. I’m so glad you enjoyed this quick bread Kat! That means so much to me! 🙂 Thanks for including your modifications — I always love hearing what tweaks work!